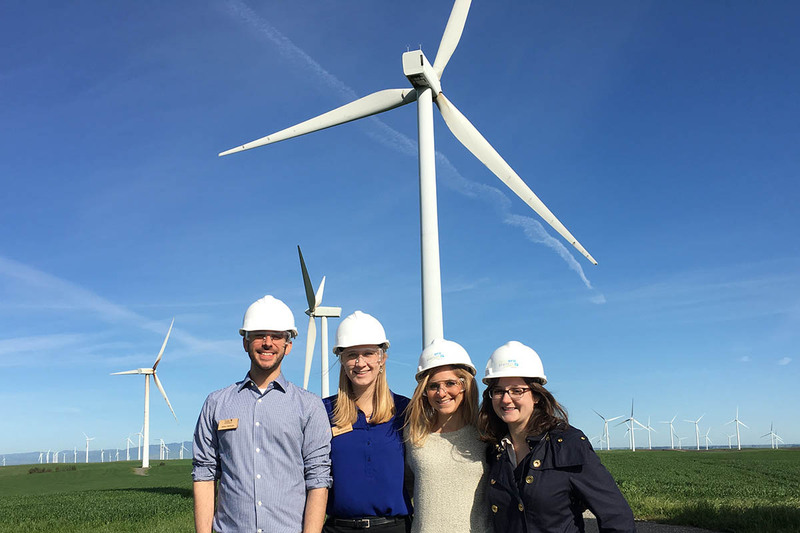 Whether your career interests lie in renewable energy, corporate sustainability, carbon/environmental markets, energy finance, or public-private environmental partnerships, Duke's Master of Environmental Management (MEM)/MBA and Master of Forestry (MF)/MBA joint degrees prepare you to navigate complex issues at intersection of business, energy, and the environment. You’ll learn to make a difference in the world—not just in profit margins. What makes MEM/MBA different from an MBA with a concentration in Energy and the Environment? Prospective students apply to each school independently, and most students apply to both schools concurrently. Each school will review your application separately and come together to discuss your candidacy. If you are already attending the Nicholas School, you must apply to Fuqua by Round 2. If you are admitted to one but not both schools, you may reapply to the desired second school later in your academic career. Admission to one school does not guarantee admission to the other. Fuqua application: apply here or view application instructions. Nicholas School application: view application instructions. Prerequisites: Nicholas School requires the TOEFL or IELTS; see additional Nicholas School prerequisites. For the MEM degree, you are required to choose one specialized concentration of study. MF students follow the Forest Resource Management (FRM) concentration. You will have the option to complete up to two concentrations, two certificates or a combination of both at Fuqua. Fuqua courses are usually held on a Monday/Thursday or Tuesday/Friday schedule. Nicholas courses are usually held on a Monday/Wednesday or Tuesday/Thursday schedule. Nicholas and Fuqua follow different academic calendars and semester schedules. Fuqua semesters are divided into two terms each. When scheduling a semester-long course at the Nicholas School, be sure to consider both of Fuqua's terms so that there will not be a conflict. MEM/MBA and MF/MBA students benefit from taking advantage of Fuqua’s many Experiential Learning opportunities, engaging directly with companies on real-world projects. You’ll have a special combined tuition, paid every semester (regardless of where courses are taken). If you start at one school and later add the second degree, you will have a one-time tuition adjustment applied in your first semester of the joint degree program. All admitted applicants are considered for scholarship, and merit scholars are selected by the Merit Scholarship Committee. Awards are made independent of eligibility for loans and work-study employment. Merit-based scholarships range from partial to full tuition and are awarded for the 2-year duration of the MBA program so that you can plan for the entire cost of your education. If selected to be a scholarship recipient, admitted students will receive notification of the award with their letter of admission. Fuqua has a variety of student loan programs that are available to both domestic and international students. Every applicant is eligible to apply for a combination of federal and alternative student loans to meet their cost of tuition, fees, books, and related living expenses. Learn more about Fuqua's financial aid programs and scholarships. Learn more about the Nicholas School’s financial aid programs and scholarships. Duke's MEM/MBA and MF/MBA degree programs prepare you for a variety of roles at the intersection of business and environment—from sustainability consulting roles with major management consulting firms, to leadership positions with energy and clean-tech companies, to corporate sustainability strategy positions with Fortune 500 companies. Duke MEM/MBA and MF/MBA students work in both the private and public/NGO sectors. As a Duke MEM/MBA and MF/MBA student, you’ll have full access to the career management centers and activities at both the Nicholas School and Fuqua. You are assigned both a peer mentor (a second- or third-year MEM/MBA or MF/MBA student) and a Career Fellow to help guide you through academics and your job search process. You also get early access to the career management modules in the Management Communications class at Fuqua, so you can benefit from this content while in your first year at the Nicholas School. Both Fuqua and the Nicholas School have relationships with key employers, as well as robust networks of alumni who are leaders in energy and environmental industries. Through industry-specific networking events and career expos, on-campus recruiting, project engagements, peer mentoring, job search teams, and individual student career coaching, Duke helps connect you with unique career opportunities. An MEM/MBA dual degree student shares the keys to her transition from financial services to energy.